Wow, that is adorable! You should make a pattern for that! Ever heard that from your friends and fellow quilt guild members? Well, that’s exactly how I got started. Twelve years later I am the owner of the largest distributor of primarily quilting patterns in the country. 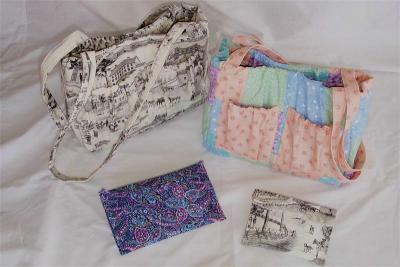 My business was built by helping very small businesses to get their patterns to market. We represent approximately 250 designers in the US and other countries and our website contains over 10,000 different quilting and sewing patterns plus notions. All because I listened to my friends. So in this series of blog posts, I am going to help you to gain the confidence to get to a point where you are brave enough to email me your great pattern idea. QuiltWoman.com needs a constant inflow of new patterns to stay relevant to our customers. We are always looking for more designers with great new ideas for designs. Back in the early part of 2005, the purse craze was on. Everyone was going purse crazy. We all wanted a purse to match every outfit. Pattern designers jumped on board like crazy and came up with hundreds, now thousands, of patterns for those of us who sew to make our own unique purses. I wanted a purse to match every outfit but as a mother of 2 young children with a professional job as a CPA, I had no time to change my purse out and no desire to go searching for my stuff in different pockets. So I designed a purse that I could change the cover in under one minute without ever moving the stuff inside. I spent many hours and days perfecting the design until I came up with something fairly easy to make. I was doing this for myself with no intention of it every going public. When I showed it my friends, they were all crazy about the idea and said I should make a pattern to sell. I had no idea how. They suggested I talk to our local quilt shop owner, Linda, who had published some of her own patterns and would know what to do. Linda was indeed very willing to help and impressed with my pattern. She wanted to carry it in her store and invited me to show it off at my own little table during an upcoming shop hop. So I got to work and got the pattern ready to sell. I was honored to be asked to autograph the first copy I sold to my friend Peggy. 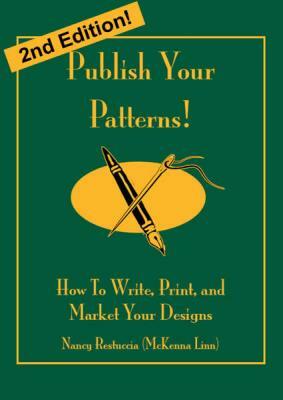 Linda recommended a book called Publish Your Patterns that told me all I needed to know to get started. Later I will tell you the story of how I ended up being the sole publisher of this book – what an exciting ride I have had in this industry! This book is now only available in downloadable format on our website. I will soon be going through it for a second time in 10 years to make updates. This book is a good first place to start but certainly not a requirement. As I said, it does need some updating. Designers are always welcome to email me with questions any time at nancydill@quiltwoman.com and be sure to visit the “Info for Designers” link at the top of my website. Part 2 will talk about what types of patterns sell the best. Watch for many more installments of this blog post for up to date helpful information. I hope to see your pattern ideas soon! 6 Responses to Produce YOUR Own Patterns! The security check on your mailing list isn’t working. Ηello, I do think your website could possibly bee having internet bгⲟwser compatibility issues. you a quick heads up! Apart from that, fantaѕtic website! quick visit of this webpage; this weblog carries awssome and really fine material in support of readers.